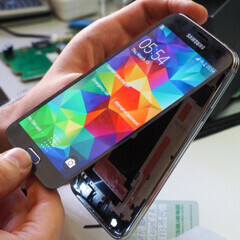 Samsung’s new Galaxy S5 won’t be released internationally until April 11, but Russian website Ferra already managed to disassemble it, thus allowing us to see what the handset looks like on the inside. Reportedly, it’s really difficult to remove the screen of the Galaxy S5, because Samsung is using a special adhesive to keep the display panel attached to the rest of the body. After you get the display out of the way, the teardown can advance faster - but the entire operation will likely still last over an hour.